The Virgen de la Soledad de Porta Vaga is one of the most venerated Marian images in Phil. Her feast is celebrated every 2nd and 3rd Sunday of November in Cavite City, where She is honored as the Queen and Patroness of the entire city and province of Cavite. She has been the refuge of the immortal spirit of the Caviteños for three centuries now. The center of the people’s religious life is their precious “Queen” --- the secret sanctuary of every “true Caviteno”. Reputed to be a relic of Spain, it is a painting of the Virgin Mary framed in carved wood. The relic is said to have been discovered, beached on the shores between the old Puerto Vaga in Cavite City and Barrio San Roque during the 18th century. The painting, presently set in precious gems, is also known as the "Virgin of a Thousand Miracles"because of many miracles granted to the faithful devotees from the day of its discovery to the present. 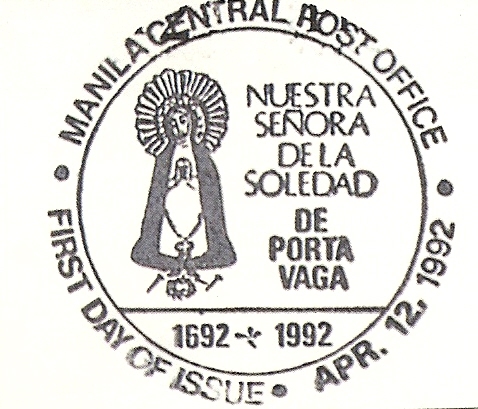 Our Lady of Solitude of Porta Vaga is one of the most venerated Marian images in the Philippines which is widely seen in a lot of Soledad icons venerated in the whole country. She is also associated with the Lenten rites as well as the All Saints / All Souls Day observance, where she is alluded as "Inang Magkakandila." proof of which are the countless votive glass candles offered to Her during her feastdays. In 1929, a new parish priest, Fr. Pedro Lerena y Lerena of Logrono, Spain, was assigned to the Puerto. At the same time, he was appointed Rector of the Ermita. His great dedication to the cause of the Virgen de la Soledad saw the beautification and the improvement of the Ermita through the years. During the Second World War, Fr. Lerena was able to retrieve the precious image of the Virgin from a junkyard where it was thrown by the Japanese invaders and brought it to the Archbishop’s Palace in Intramuros, Manila and later to the vaults of the Philippine National Bank for safekeeping. It was brought back to Cavite only after the liberation in 1945, this time to her home at the San Roque church because the Ermita was destroyed by Japanese and American forces. Until his death in 1972, Fr. Lerena served as the guardian of Cavite’s priceless treasure. An inscription was found at the back of the painting, “A doze de Abril 1692 años Juan de Oliba puso esta Stsma. Ymagen Haqui.” This inscription says that “this sacred image was placed here on April 12, 1692 by Juan Oliva” but it does not clearly tells us the exact date of the Virgin’s arrival. It is possible that it is the date when the Virgin was enthroned at the altar of the Ermita de Porta Vaga in the 17th century. Devotees of the Virgen de la Soledad were not satisfied in placing her in one of the seven churches of Cavite Puerto. They decided to build for her the Ermita de Porta Vaga, a small chapel near the gate of the Porta Vaga, the fortlet guarding the entrance to the Puerto de Cavite. For three centuries, it became the shrine of the Virgin. This particular icon was used to bless the galleons plying between Cavite and Acapulco (Mexico) during formal sending off ceremonies. Thus, she was called the Patroness of the Galleon. 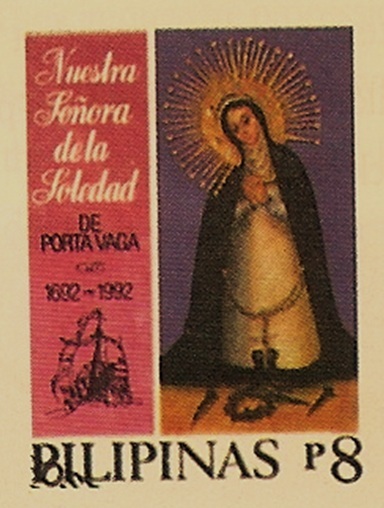 The most venerated icon of La Virgen de la Soledad de Porta Vaga is an invaluable treasure inherited by the Caviteños from their antepasado (ancestors). This is the oldest existing dated Marian painting in the Philippines. The Virgen de la Soledad was acknowledged as the Celestial Guardian and Protectress of the entire province of Cavite and its port since her arrival in Cavite shores. A replica of the Ynang Nag-Iisa is widely venerated in different parts of the country which includes San Isidro(Nueva Ecija), Camba (Manila), Subic (Zambales) and Buhi (Camarines Sur). The devotion to the Virgen de la Soledad de Porta Vaga is the crowning glory of the Caviteños faith and religiosity. In it are interwoven their rich and colorful history that has spanned three centuries. Since her arrival, the image has been linked to a strong fortress that symbolizes a great heritage, she has been the symbol of that solid inner strength sustaining her people.